Today, the Winnipeg Free Press ran an article on the Winnipeg Skeptics. And it was a good one! During a phone interview last week, Sylvia Browne told the Free Press that on top of her lecture, she'll be able to deliver psychic messages to as many as 300 audience members whe she appears at Pantages Playhouse Theatre on Thursday night. Gem Newman has his doubts -- which is why he plans to be at the theatre well before the crowds start pouring in. No, Newman is not a super fan hoping to intercept his idol and score a private reading. The 26-year-old computer scientist is founder of the Winnipeg Skeptics, a group for people interested in the "investigation and critical examination of extraordinary claims." And if anyone provides grist for that mill, he says, it's Browne and her infamously inaccurate predictions about missing and murdered children. Newman says he and his cohorts plan to show up outside Pantages before the show simply to offer some food for critical thought to ticket holders who paid up to $96 to hear the self-proclaimed psychic and medium lecture about the afterlife and relay messages from dead relatives and spirit guides. "A few of us are just going to hand out pamphlets to passersby, explaining how they, too, can appear to be psychic by using some common methods like cold reading," the animated redhead says over morning coffee at a downtown eatery. Newman, who is wearing a T-shirt that reads (once you solve the mathematical equation) "Nerds Forever," stresses that the Sylvia Browne Awareness Campaign is not a protest and skeptics will not be getting in people's faces. "Our intention is not to be intrusive or offensive, it's to educate. A lot of people see these shows and think they're pretty impressive -- and they are if you don't know what to look for." As an aside, I've discovered that I have a lot of trouble smiling in pictures. I was under the distinct impression that I was grinning as hard as I could for that shot. 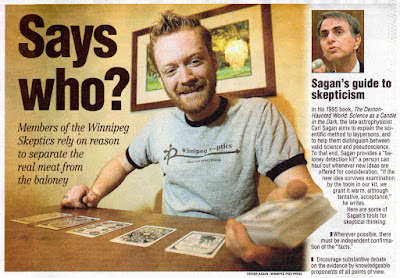 Scott Carnegie, a 37-year-old television producer, says joining the Winnipeg Skeptics gave him back the sense of community and support he lost when he stopped going to church a few years ago. "Anybody is who is interested in how the world really works would probably get something out of it," Carnegie says. "It can be a real challenge to look at your beliefs and positions and ask yourself if they're true. That's a skill I don't think many people have." "To me, everything is provisional; it's always open for re-examination." The article even features an excellent sidebar on Carl Sagan's The Demon-Haunted World (which was at the top of my list when the reporter asked for skeptical literature)! All in all, I think that the piece is a definite skeptical win. Edit: I've added a scan from my hard-copy of the article. It was at once both startling and humbling to have my image set next to that of Carl Sagan. I just read about you and your group in today's Free Press. I just wanted to congratulate you on such an appositive article, which is sure to garner some well-deserved recognition. It was very heartening to learn of your group; it is all to easy, sometimes, to feel like a lone voice of reason, railing against the tide of pseudoscience and superstition that threatens to engulf our all-too-credulous society, and it's great to know that skepticism is alive and well in our city.